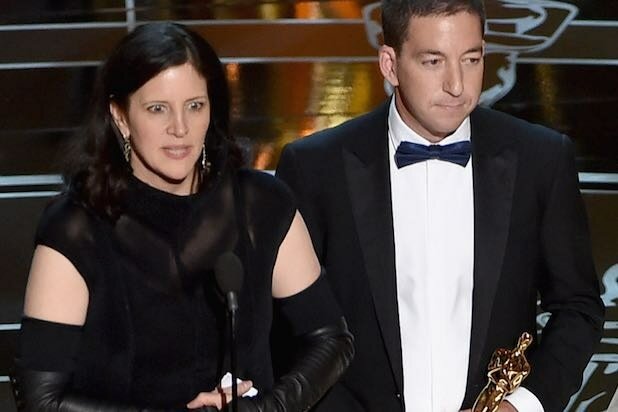 “Citizenfour” director Laura Poitras thanked whistleblowers and journalists who are “exposing truth” during her acceptance speech after winning the Academy Award for Best Documentary, Feature on Sunday. The TWC Radius release was no surprise victor, however. In the awards race leading up the 87th Oscars, “Citizenfour” won every single documentary award. Poitras was filming the documentary while Greenwald was first meeting with Snowden to decide when and how they would release top-secret documents that revealed covert surveillance programs run by the NSA. The U.S. Department of Justice charged Snowden with two counts of violating the Espionage Act and theft of government property in 2013. He is currently living in Russia, where he was granted temporary asylum last year. “The subject of ‘Citizenfour,’ Edward Snowden, could not be here tonight for some treason,” Oscars host Neil Patrick Harris joked after Poitras’ speech.